Hello! Michelle here to welcome in a new month and a new challenge! I will have a card using Newton’s Nook designs stamps later in the month, but today, I have a card using Hero Arts stamps and a stencil for you. I started with the “swirl stencil” from Hero Arts, and added some Wilted Violet and Spun Sugar Distress Inks to a white card base. 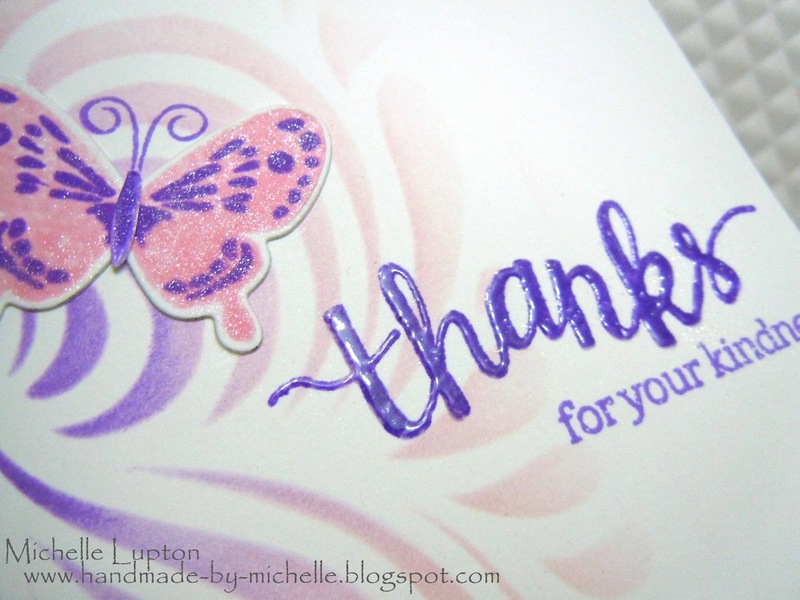 I then stamped the “thanks” from the Hero Arts “thanks stamp & cut” set and clear embossed it (I actually added more embossing powder while it was still hot to get an extra-glossy look). I then stamped the rest of the sentiment. The butterfly (from “color layering butterflies”) was stamped in the same inks as the background, then die cut and adhered to the card (I stamped the antennae to the card base because I didn’t have a die for that particular stamp, and I didn’t think fussy-cutting the antennae was something I really wanted to do! I added a coat of Wink of Stella to the butterfly, and I was done! The latest challenge is Clean and Simple – we’d love it if you would link up your CAS creation using the Inlinkz below. You have until 5pm on April 29th to join in! 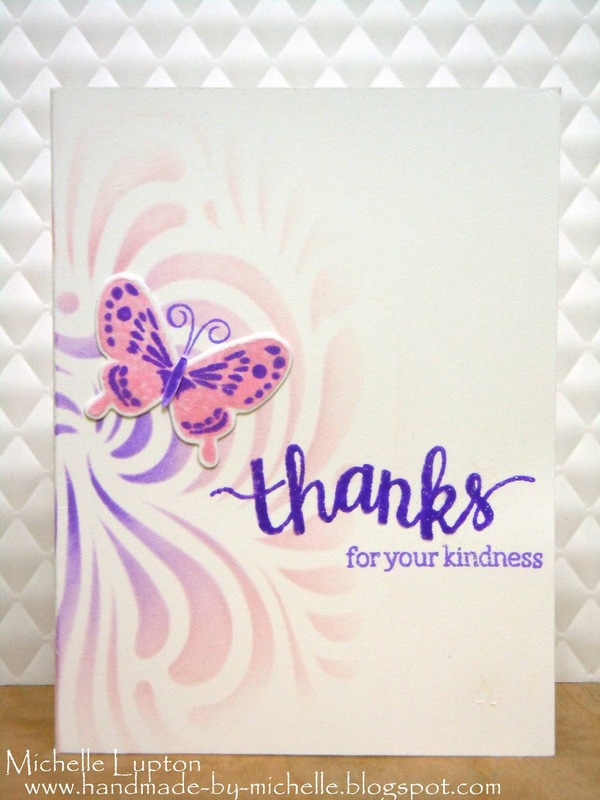 love the colors you used Michelle – and the background is so pretty with that butterfly! A pretty stenciled card! I do not have any Newton's Nook stamps yet, but I have been admiring the cats since I heard of them just recently. I love Clean and Simple so I will definitely be joining in this month! Oh, beautiful stenciled background. I love that you faded it out midway – gorgeous! Gorgeous colours, love that stencil.